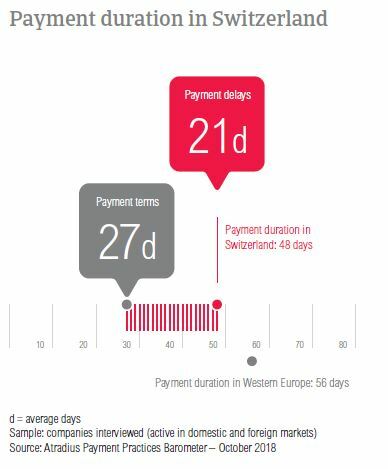 92.5% of Swiss respondents said that they experienced late payment in 2018. This is one of the highest percentages next to that of Austria and Belgium. Despite the 2018 decrease, at 92.5%, the percentage of respondents who experienced late payment in Switzerland is still one of the highest in Western Europe. Top reasons for payment delays are insufficient availability of funds and buyers using outstanding invoices as a form of financing. The proportion of past due B2B invoices is stable compared to one year ago but significantly above the regional average. In order to manage the impact of overdue invoices, 23.0% of Swiss respondents had to take specific measures to correct cash flow and 19.3% had to postpone payments to suppliers. For 21.4% of survey respondents, overdues led to revenue loss. The proportion of total B2B sales made on credit in Switzerland decreased from 28.0% in 2017 to 25.4% in 2018. This is the third consecutive year with a decrease, and Switzerland had the second lowest proportion of sales made on credit in the region. Respondents in the country are far more likely to sell on credit to domestic B2B customers than to B2B customers abroad (29.5% versus 21.2%). Long-lasting relationships, trust and the desire to expand their businesses are the main reasons why Swiss respondents sell on credit domestically. However, the poor payment behaviour of the customer and the lack of information on the customers’ business or payment performance would prevent respondents in Switzerland from offering credit terms domestically. These reasons were mentioned by 36.2% and 25.5% of respondents respectively. We trade on credit so that our business can continue growing and developing. Similarly, Swiss respondents sell on credit to B2B customers abroad if they are trusted customers with whom they have been doing business for a long time. The desire to expand internationally and establish a foothold in new markets was also mentioned frequently. The main reasons why Swiss respondents would not offer credit terms to B2B customers abroad are the lack of information on the customers’ business or payment performance and poor payment behaviour by the customer (mentioned by 37.5% and 30.0% of respondents respectively). We trade on credit with foreign B2B customers to attract new customers. 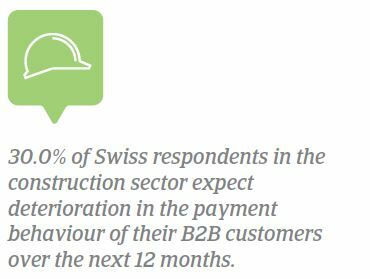 92.5% of Swiss respondents said that they experienced late payment by their B2B customers in 2018. This compares to 95.5% in 2017. 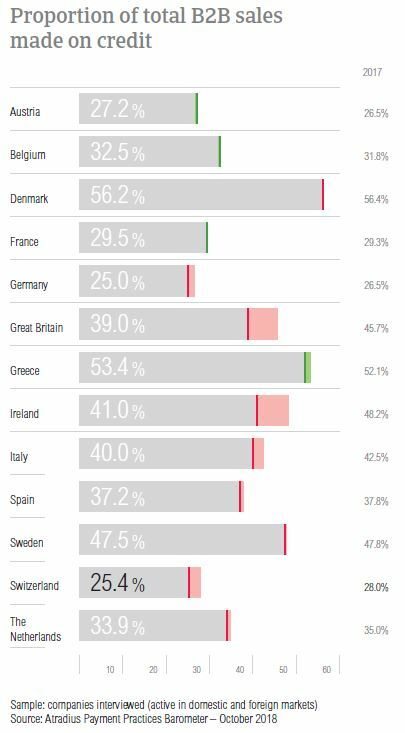 Despite the decrease, payment delays are experienced by more respondents in Switzerland than in all other Western European countries surveyed except Austria and Belgium. Payment delays from domestic B2B customers were reported to occur slightly more often than payment delays from foreign B2B customers. On average, in 2018, 46.5% of invoices in Switzerland went past due. A higher percentage of foreign B2B invoices remained unpaid by the due date. The proportion of domestic and foreign past due B2B invoices has remained stable (46.2% in 2017). In 2018, the average Days Sales Outstanding (DSO) figure recorded in Switzerland is 36 days, showing no change compared to 2017. Looking ahead, 64.6% of Swiss respondents said that they do not expect any changes in their company’s DSO over the next 12 months. Of those who foresee changes, more respondents expect an increase than a decrease (25.5% versus 10.1%). In 2018, the average payment terms in Switzerland were shortened. Swiss suppliers gave their domestic B2B customers 27 days to settle invoices (28 days in 2017). Foreign B2B customers had, on average, 26 days to pay (28 days in 2017). Confirming the above, 50.0% of respondents in Switzerland stated that they are not likely to differentiate payment terms between domestic and foreign B2B customers. Of those that differentiate, 26.6% said that they are likely to give their domestic B2B customers shorter average payment terms and 23.4% that they are likely to give their domestic B2B customers more time to settle payments. The main reasons for differentiating payment terms in Switzerland are internal policies, industry practices and the economic situation in the export country. According to the survey findings, payment delays in Switzerland have dropped significantly in 2018. A six day decrease was recorded for domestic B2B customers (who delay payments, on average 20 days) and a four day decrease was recorded for B2B customers abroad (on average, 22 days). Based on the changes mentioned above, the average payment duration in Switzerland decreased from 54 days in 2017 to 48 days this year. This is under the regional average of 56 days. In Switzerland, domestic payment delays occurred mainly because of insufficient availability of funds and because the buyers are using outstanding invoices as a form of financing. The first reason was cited by 41.2% of respondents, significantly fewer than one year ago, the second by 28.1%, significantly more than one year ago. Payment delays from B2B customers abroad occurred most often because of insufficient availability of funds and the inefficiencies of the banking system (mentioned by 39.8% and 25.3% of respondents respectively). 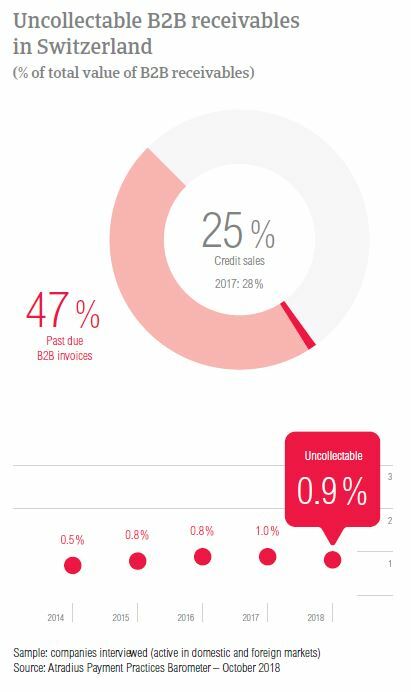 For 41.2% of Swiss respondents, overdue B2B invoices had no significant impact on their businesses over the past 12 months. However, 23.0% said that they needed to take specific measures to correct cash flow and 21.4% reported lost revenue. 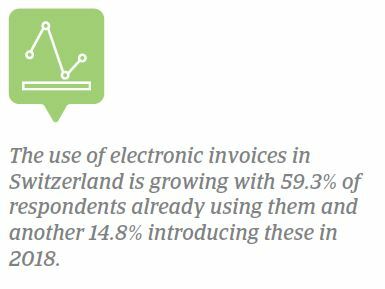 Electronic invoices are used by 59.3% of Swiss respondents. While they are not yet invoicing B2B customers online, 14.8% of survey respondents said that they are introducing electronic invoices in 2018. Quite a high percentage of respondents, 24.9%, said that they are not making use of electronic invoices. Evaluating whether e-invoices had an effect on payment duration, 54.5% of respondents declared that invoices sent online were paid faster. 39.0% of respondents did not notice a noteworthy effect on payment duration while a low 6.5% experienced slower payment. Along with their peers in Western Europe, respondents in Switzerland were asked to rank the following potential risks to global economic growth in order of significance: US protectionism turning into a trade war, misguided Fed policy, a ‘hard landing’ in China and geopolitical risk. 43.7% of Swiss respondents (regional average 44.8%) said that US protectionism is the most significant risk to global economic growth over the coming 12 months. Another 23.9% believe that, while US protectionism potentially turning into a trade war is a significant risk, it probably isn’t the most significant one. 25.8% perceived geopolitical risk to be the most significant. In 2018, the average proportion of uncollectable receivables in Switzerland remained stable at 0.9% (1.0% in 2017). This is below the regional average of 1.3%. Domestic B2B receivables were written off significantly more often than foreign B2B receivables. 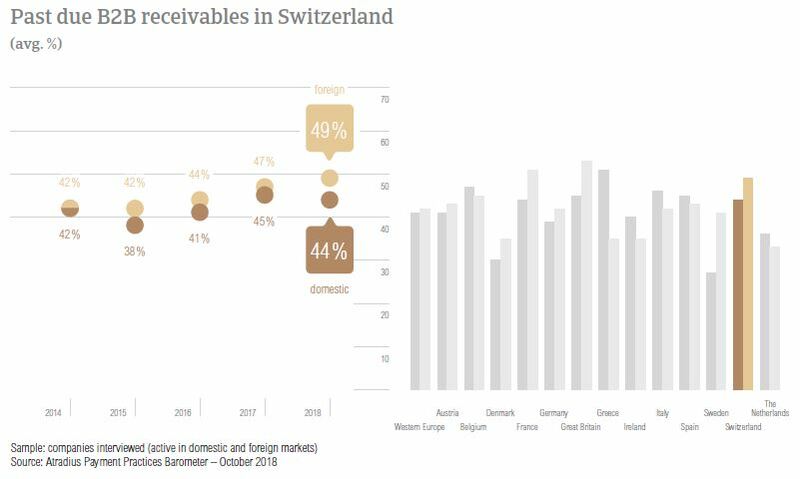 In Switzerland, uncollectable receivables originated most often from B2B customers in the construction, consumer durables, business services and services sectors. The main reason receivables are written off as uncollectable is bankruptcy. This was mentioned by 67.1% of respondents, a higher percentage than one year ago (60.0%) and the second highest in the region. Other frequently reported reasons for write-offs are the high costs of pursuing the debtors and the inability to locate the customer (mentioned by 30.7% and 28.6% of respondents respectively). In 2018, the average payment terms given in Switzerland stand at 27 days. B2B customers in the machines and paper sectors enjoy payment terms longer than the country average (36 days and 30 days respectively). In contrast, B2B customers in the chemicals sector were asked to pay about one week faster (on average, within 20 days). B2B customers in the construction and consumer durables sectors generated some of the longest payment delays. B2B customers in these sectors, paid on average 14 and 18 days after the due date. The main reasons behind the payment delays in the construction sector are buyer using outstanding invoices as a form of financing and insufficient availability of funds (each of these reasons cited by 43.0% of respondents). In the consumer durables sector, 55.0% of respondents cited buyers using outstanding invoices as a form of financing and 37.0% insufficient availability of funds. Most respondents in the above mentioned sectors do not expect changes in the payment behaviour of their B2B customers. Of those expecting changes in the construction sector, 30.0% cited deterioration and 10.0% improvement. In the consumer durables sector, 27.0% foresee deterioration and a low 6.0% improvement. With the rebound of economic growth, business failures are expected to decrease year-on-year in 2018, but nevertheless to remain on an elevated level.